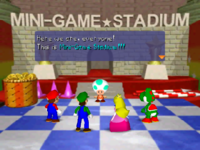 Players getting the introduction by Battle T.
Mini-Game Trial is a game mode in Mario Party 2 and a sub-mode of Mini-Game Stadium. The mode is unlockable in Mini-Game Land. It is unlocked by buying at least 3 4-Player, 2-vs-2, and 1-vs-3 minigames. Luigi about to land on a Red Space. 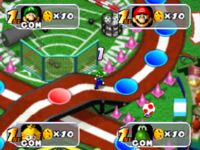 This mode plays similarly to Mario Party's Mini-Game Stadium in the Mini-Game House's Pot O'Skills. The map is in the shape of a figure eight. After the player chooses characters and the number of turns, the game starts. Similar to the party mode boards, four players will play on a board, each getting a turn to roll the dice, which will determine how many spaces they will move across. However they do not gather Stars at all, the focus is on playing minigames and gathering as many coins as possible. The board has only Blue Spaces, Red Spaces and Battle Spaces. The player never loses or gains coins by stepping on spaces. Instead, the spaces are only used to determine the color of the player's panels. And by that, the minigame type is chosen. Once all four players finish their turns, a random minigame is chosen. After any player completes a lap, they are rewarded with 10 coins. After the specified number of turns are done, the player with the most coins wins. The following table shows how many spaces there are on the board, and how many there are of a certain type. Bowser • Toad • Goomba • Boo • Koopa Troopa • Thwomp • Kamek • Whomp • Mr. I • Mushroom Genie • Steamer • Snifit Patrol • Shy Guy • Baby Bowser • Woody • Professor Fungi • Battle T.
This page was last edited on October 31, 2017, at 15:30.